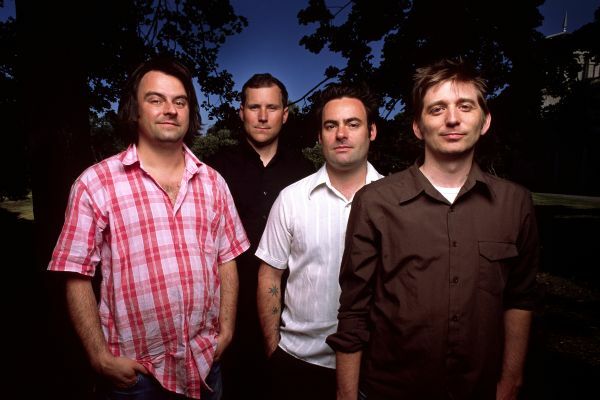 The Weakerthans recorded their fourth album, Reunion Tour, in March 2007, in a recording studio built above a factory on the outskirts of Winnipeg, the cold prairie city where the band was born 10 years ago. The factory produces cases for machines and computers and musical instruments, but only in the daytime; for a week and a half in the middle of winter, after the casemakers departed each afternoon at 4:30, the musicmakers, led by producer Ian Blurton, would arrive and play all night, crafting new sounds and new songs on the factory floor and then driving back to the city through the frigid Manitoba pre-dawn. “Tournament of Hearts,” the curling song, is a perfect example of what John K. Samson, the band’s lead singer and lyricist, calls “first-person fiction,” and there’s a lot of that on Reunion Tour. whose assigned route takes him every two hours past a house that is haunted only for him. And there are real-life characters, too: “Bigfoot!” tells the story of a ferry operator in northern Manitoba who saw the legendary creature and was then taken advantage of and mocked by everyone from cable news networks to the citizens of his own small town. In “Hymn of the Medical Oddity,” we meet Winnipegger David Reimer, who was born a boy but raised as a girl after a famous and tragic medical experiment. songs are about men, some sympathetic, some despicable. Two of the songs, “Sun in an Empty Room” and “Night Windows,” are inspired by specific Edward Hopper paintings. And, more elusively but not less significantly, this is a record made during wartime, and images of combat and struggle lurk on many tracks. The Weakerthans have long been known for their lyrical ingenuity, but they are, after all, a rock band, and Reunion Tour is a musical triumph. Stephen Carroll, who, like Samson, lives in Winnipeg, plays guitar, pedal steel and keyboards. Greg Smith, the newest member of the band, plays bass and keyboards. He lives in Toronto, as does Jason Tait, who plays drums and percussion, as well as keyboards, banjo, vibes and glockenspiel. Reunion Tour is not itself a reunion – The Weakerthans have never gone away – but it is a giant step forward for the band. There’s a new confidence and comfort here, four musicians more sure than ever of who they are and what they want to say.